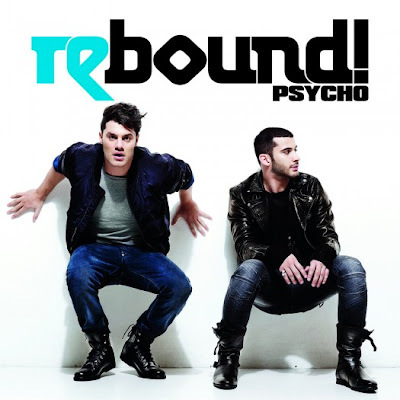 One of the biggest Swedish pop-discoveries of 2010 Rebound starts new year with brand new single "Psycho" and their first video they participate in themselves! Being artists we kept our eyes on since their participation in Idol-2009 and project that didn't left us without news during whole last year Rebound released 2 brilliant pop-singles "Hurricane" and "Not Helpless" celebrating fresh mix of r'n'b and dance music so popular in country but seems like never been taken successfully by someone else before and that's what was easily won by Eddie Razaz and Rabih Jaber - #1 of Swedish chart in a pack with thousands screaming fans around Sweden. Not long time ago band presented video for stunning "Not Helpless (Rink´s If Only You Knew Remix)" that along with video looked like completely new separate release and now it's time for presentation of third single "Psycho". "Psycho" is another amazing example of modern melodic pop generously powdered with r'n'b sound and ulra-tasty electronic production this time in a ballad vein but chorus still pushing right buttons to make listener sing along already after first listen. "Psycho" was written by Jonas Saeed (Ace Of Base, Ola, Darin) and American songwriter Greg Ogan (Jason Derulo, Britney Spears, Kelly Clarkson, Leona Lewis, etc.) who also produced it. Mix was provided by Anders Hvenare (Miike Snow, Britney Spears, Tove Styrke) and the video shot by Mikeadelica that turned to be dark and bloody but exciting story to follow. Star team, star song and hopefully star success! loving this. loving it! Also i am quite smitten with their boots on the single cover :) They would keep my tootsies dry on the walk to work each morning. Hurrah! Oh, that's true, boots are as amazing as cover in common, hope it'll become big hit in Sweden, they need to release it physically and make massive club/trade center touring around country.